With iOS 5, Apple has decided to tackle the to-do and reminder app market by offering its own solution that's tightly integrated with iCloud, calendars, and Address Book. 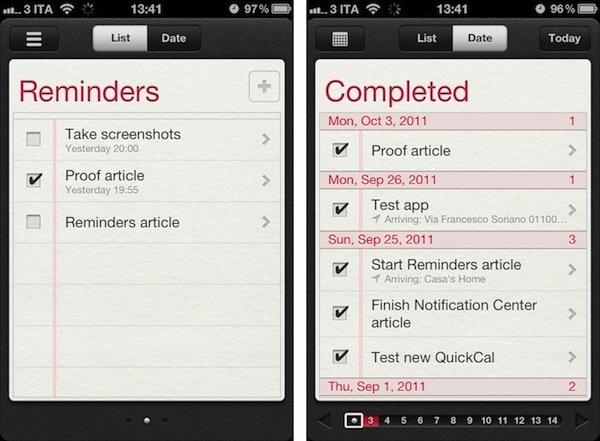 Reminders, a new system app in iOS 5, allows users to easily and quickly jot down their to-dos and organize them in "lists" that are stored and backed up to the cloud in real-time. Reminders are constantly pushed across devices and the web on iCloud.com, and they come with a series of options to give them date-based alarms, a location, or notes. Reminders is a straightforward app that can't be compared to more complex to-do and project management solutions like OmniFocus or Things, but it doesn't need to achieve or aspire to such complexity as it's a utility aimed at making it extremely simple to quickly create a reminder, and forget about the existence of the app itself. You won't spend time "tweaking" or "customizing" Reminders; you can't assign "tags" to to-dos and move them around between folders. The app has got a single theme (as per Apple's recent skeuomorphic trends, the app resembles an old leather-bound agenda with the heavy use of textures) and two functionalities besides reminder creation: lists and search. There are differences in user experience between Reminders for the iPad and its iPhone counterpart, but the UI is the same -- only arranged in different ways to best suit the navigation schemes offered by Apple's devices. On the iPad, you've got a fixed sidebar (think Settings.app) with two tabs on top (List and Date), a search bar, an Edit button, and your Reminders lists. By default, the app creates a "Reminders" list and a "Completed" one as soon as you check off your first item. To switch between lists on the iPad, you tap on them in the sidebar. On the iPhone, you start with a default view and swipe to switch between lists. The sidebar seen on the iPad has been relocated into a "Lists" button on the iPhone's upper toolbar; this section contains the same interface elements of the iPad's sidebar. The "Date" tab automatically triggers a vertical calendar view in the iPad's sidebar, with the possibility to scroll to open a specific day on the right panel, search, tap on a day manually, or jump back to "Today". The iPhone's Reminders app opens the Date tab in day mode by default, and the calendar view is accessible by tapping on a button in the toolbar. 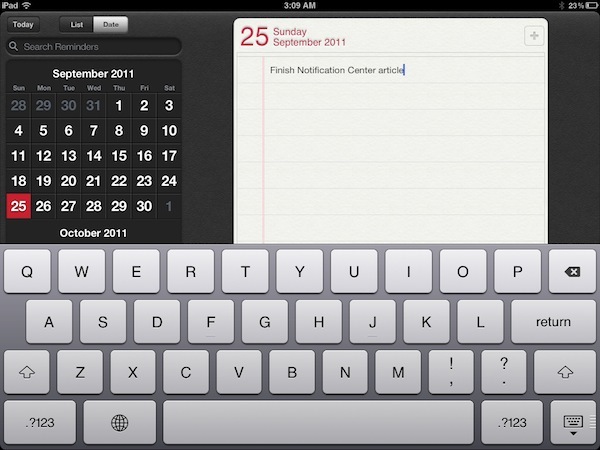 As with Lists, this button launches the same interface seen on the iPad, only at a smaller size. Creating a new to-do requires you to tap on the + button in the upper right corner, type something, and hit Return. This will create a new to-do that will begin syncing to the cloud immediately if you've configured Reminders with iCloud. A reminder can be just a string of text -- you can, however, tap on it to enter a Details view that offers more options to select a due date, priority and list, or attach some notes. 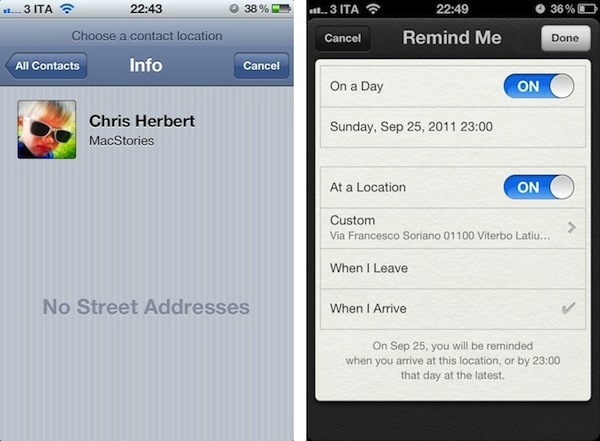 One of Reminders' key features is its location-based alert system. Thanks to Apple's geo-fencing technology introduced in iOS 5 -- and open for third-party developers to create apps with -- the app can send you an alert when you're about to "arrive at" or "leave" a particular place. This can be useful if you, say, want to be reminded of groceries when you arrive at the supermarket's parking lot, or don't want to forget about those documents when you're leaving the office. There's a caveat though: you can't manually type an address as Apple chose to restrict this feature to a "contact location". This means the address will have to be already attached to a contact in your Address Book, which can be inconvenient if you don't want to keep the supermarket among your friends and family contacts. On the other hand, I assume Apple has done this for two reasons: saving users the time of typing addresses, and providing a familiar way to access often-used locations. Address Book contacts without a street address can't be added to a new reminder. Bottom line: if you plan on using Reminders for groceries, add the supermarket to your Address Book. Reminders' location-based alerts won't work on an iPad 2 WiFi because of the device's lack of GPS capabilities; I haven't been able to test this on a 3G iPad, but I suppose it'll work. You can choose to be reminded on a day, at a location, or both. "On a day" will trigger iOS' standard date picker to choose a day and time. Location has only two options -- "When I Leave" and "When I Arrive" -- and there are no filters for advanced personalization of location alerts (say, "remind me 10 minutes after I arrive at the office" -- no, you can't do this in iOS 5). You can repeat an alert every day up to every year (Apple must have thought of anniversaries and forgetful husbands) and different priority settings will correctly show up when reading Reminders from Apple's iCal through iCloud. 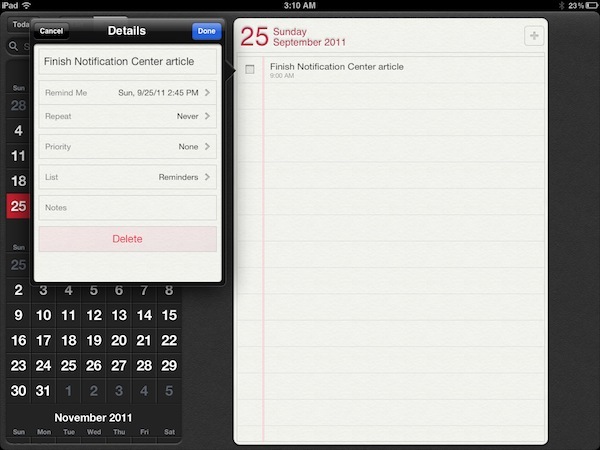 If you're using iCloud as an all-in-one solution for mail and calendars, Reminders will appear in iCal's sidebar. Last, you can attach text notes, but the app won't make hyperlinks clickable. 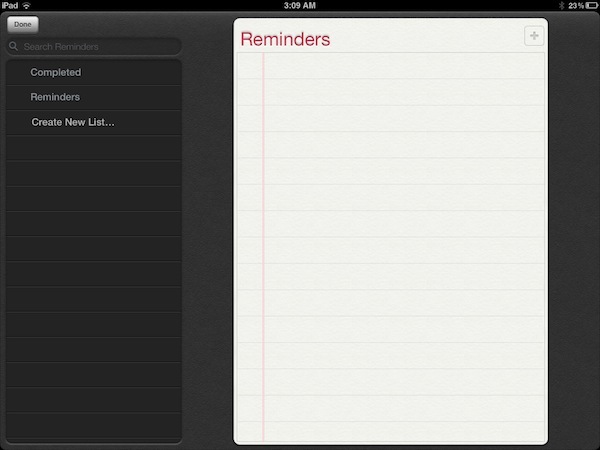 What I'd like to see in a future version of Reminders and iOS 5 is systemwide support for to-do creation. Currently, if you receive an email or text message that contains a date, you can tap on it to instantly create a new calendar event thanks to Apple's EventKit framework. Personally, I think it'd be neat to be able to select some text, and instantly create a reminder off of it -- but then again, I still think a Services menu for iOS would be great. Meanwhile, Apple is allowing voice-based creation of new reminders through Siri, the iPhone 4S' voice assistant. Reminders isn't Apple's answers to OmniFocus and other GTD apps, but it sure will eliminate the need for simpler to-do and list-making apps that have been sold for a price on the App Store until today. For the average user who needs to jot down a quick thought or to-do, Reminders will be "enough" (and it doesn't hurt that it's got a nice UI and sync with iCloud out of the box). The power user will still look elsewhere, but with Reminders Apple has made iOS (even slightly) more efficient and productive.